Vodafone Idea Ltd is down but not out. Its financial results are a mess. The recently merged company reported a pro forma Ebitda of ₹ 977 crore for the September quarter, at margins of just 8.1%. At the time Vodafone India Ltd and Idea Cellular Ltd announced their merger, margins were far more healthy at 26.5% and profits were more than five times higher than current levels. Bharti Airtel Ltd had also reported Ebitda margins of about 21% for its India wireless business last quarter. Ebitda stands for earnings before interest, tax, depreciation and amortization. 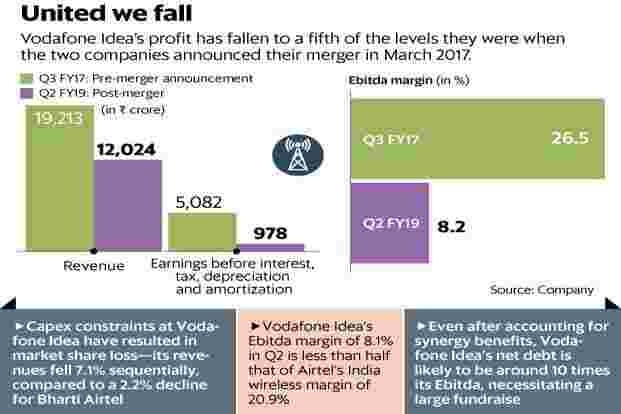 Vodafone Idea will be quick to point out that this great divide with Airtel’s margins will get bridged after accounting for synergy benefits. But note that even after these savings kick in, profit will be merely enough to meet interest costs. “Current annualized Ebitda plus synergy gains could mean a baseline Ebitda of ₹ 10,000-12,000 crore. This would not leave much to spend on capex after paying interest," analysts at Kotak Institutional Equities wrote in a note to clients. What’s more, Vodafone Idea’s net debt stands at about 10 times these estimated Ebitda figures. As such, there is a desperate need to deleverage and raise funds for capital expenditure. Though Airtel is smaller in revenue terms, its capex is more than 2.5 times that of Vodafone Idea. Capex constraints are reflecting in revenue market shares. Vodafone Idea’s pro forma revenues fell 7.1% sequentially in Q2, much higher than the 2.2% decline reported by Airtel. It’s against this backdrop that the company has announced fundraising plans of ₹ 25,000 crore (about $3.5 billion), of which more than ₹ 18,000 crore will come from the promoters. At the current share price, this could mean a dilution of around 69% in the company’s equity. However, the news could lead to a rally in the stock, leading to lower dilution. Vodafone Group Plc has indicated that it will bring in about $1.5 billion, which is a positive surprise. When the merger was announced, the UK-based company seemed keen on reducing its exposure to India, rather than increasing or even maintaining its stake. For now, plans to bring down its 45% stake in the Indian business on a par with that of the Aditya Birla Group (which is currently at 26%) seem to have been put on the back burner. Note that the Vodafone Group can raise funds by selling its stake in the Infratel-Indus Towers firm, and needn’t necessarily tap the parent company for a fresh infusion of funds. Vodafone Idea also said that it is looking at some asset sales to raise more cash. A moot question is if the ammunition provided by the fundraise will make things better or worse on the tariff front. It’s quite likely that a more aggressive stance from Vodafone Idea will make the market share battle uglier, especially as Reliance Jio Infocomm Ltd is still a long distance away from its target of 50% revenue market share. As such, things may get worse before they get better on the profitability front. Of course, it goes without saying that Vodafone Idea has little choice but to raise cash quickly and deleverage, and provide room for its capex plans to defend its market share. Whether this will be enough is anybody’s guess.